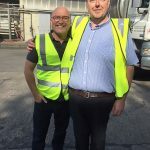 Masterchef star Gregg Wallace explores the cheesemaking secrets of Wales’ oldest dairy co-operative | News by Wales Express News, People Before Profit! The secrets of how cheddar made in North Wales using a using a century-old technique is transformed into ‘squeezy cheese’ sold as far afield as Greece, Malta and Korea, have been revealed by TV star Gregg Wallace. The Masterchef presenter visited South Caernarfon Creameries’ plant on the Llyn Peninsula to find out how Wales’ oldest dairy farming co-operative has scaled up traditional cheesemaking techniques to produce 36,000 tonnes of cheddar every day. In an hour-long episode of the BBC2’s Inside the Factory programme, Gregg and fellow presenter Cherry Healy followed the journey of how some of that cheese is used to make Primula’s popular ‘squeezy’ cheese ‘n’ jalapeños. 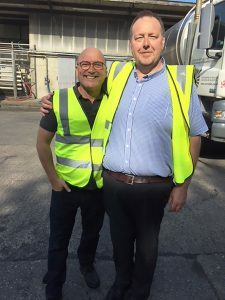 Gregg gets an exclusive peek behind the scenes at how fresh milk from farms across North and mid Wales, is turned into top quality cheddar, starting with a 28,000 litre delivery of milk to SCC. SCC was set up in 1938 after a campaign to get a fair milk price for local farmers, and now makes the Dragon brand cheese, as well as a range of other award-winning cheeses supplied through supermarkets and independent shops across the UK. Gregg is taken on a tour of the factory by SCC’s “grand fromage”, Head of Operations Mark Edwards find out how SCC’s mature cheddar is made, before being sent up to Primula’s factory in Gateshead where it forms the base for the ‘squeezy’ cheese ‘n’ jalapeños recipe. He is shown silos from where 400,000 litres of milk from farms across North and mid-Wales is processed each day – enough to fill 5,000 baths. Mark explains how tankers come in 20 times a day with each tanker carrying 28,000 litres of milk from Freisian cows. They watch how each tanker is tested to ensure it has high levels of fat and protein before cheese production begins. The programme follows journey of the cheese along 600 metres of pipe into the creamery’s 629 square metre cheesemaking room, where it is first pasteurised by blasting it with heat for 25 seconds to destroy any unwanted bacteria. Once pasteurised, the milk gushes into a vat where starter culture containing specially selected good bacteria is added to begin the cheesemaking process, by feeding on the lactose in the milk and changing it into lactic acid, while forming the building blocks for taste and texture. The exact mix of bacteria is top secret, but Mark reveals the cheese mixture is kept at a cosy 39 degrees Celsius for 25 minutes, and different cultures are used for each cheese. Gregg says: “South Caernarfon Creameries makes 36,000 tonnes of traditional cheddar every day. The dairy is owned co-operatively by the farmers who supply it with milk. Their tankers come into the intake area 20 times a day. The programmes explains how Britain is a nation of cheese lovers, working our way through nearly 2,000 tonnes of it every day, and it all starts off with milk – taking 700 tankers of milk to feed Britain’s daily cheese habit. At SCC Gregg learns about the microbiology responsible for splitting milk into curds and whey to form hard cheese and how milk is nearly 90% water the rest is fat plus sugar known as lactose, and protein. The programme’s historian Ruth Goodman is finding out how cheddar became the predominant hard cheese world wide after Victorian cheesemaker Joseph Harding first standardised production methods a century ago. Back at SCC Gregg watches as the co-operative’s Cheese Quality Manager Shôn Jones checks the temperature of the cheese, and employs strict time keeping methods similar to those first used by Joseph Harding to reliably produce high standards every day. The programme follows the addition of rennet, a natural enzyme, to turn the milk into a solid. Almost two hours after the fresh milk arrives it had turned into a jelly-like ‘yoghurt’ of protein and fat, before starting to separate into curds and whey. Three hours into the process and 12,000 litres of whey is drained off and turned into a supplement popular with body builders. The curds are then stirred and salt is added to turn the curds into a hard cheese. Mark explains South Caernarfon Creameries’ unique approach, using traditional open tables to hand salt each batch of curds, with the salt performing several functions to slow the activity of the cultures, drive out moisture, add flavour and act as a preservative. The curds are then shaped in SCC’s pressing area where they are blown ten metres up to the top of metal cheese towers installed thanks to £13.5m investment in the SCC cheesemaking facility over the last five years. Inside the cheddar towers, pressure from the weight of the cheese equivalent to the weight of two dairy cows lying on top and squashing it down (1.5 tonnes), causes the cheese to compact at the top and emerge as cheddar, with a new block created in just 45 minutes. The cheese then goes into a cold store to mature allowing the bacteria to developed for maturity for between three months to a year, to emerge as cheddar. The cheddar is then packed up and delivered to the Primula factory in Gateshead, which is run by a charity and has been making cheesy products since 1924. Here the 20 kilo blocks of cheddar from South Caernarfon Creameries is chopped and mixed with a milder gouda cheese, before being cooked and combined with other ingredients including water, whey and chopped chillis. It is then piped into Primula’s distinctive tubes and packed ready for distribution across the globe, 11 hours and 56 minutes since production began with the delivery of milk to SCC. Every day Primula distributes 150,000 tubes to supermarkets all over the UK and it with fans as far as Malta, Greece and Korea. Gregg says: “What a journey for a piece of cheese, from a creamery in North Wales from a factory in Gateshead. Linda Lewis Williams, new product development manager at SCC said: “We are delighted to be working with Primula, it is a great brand and we are very pleased our cheese is going in the jalapeños product. The ‘Cheese’ programme comes in the fourth series of Inside the Factory, with previous episodes having visited some of the UK’s best known manufacturing sites, include the Nestlé chocolate factory in York, the Heinz baked beans factory in Wigan and the UK’s largest brewery in Burton upon Trent.